Before we go into the Ophanim postures themselves, the most essential element required is the specific breathing techniques associated with each one of the letter positions. This is the breathing of the “Yud/Heh”, or 10/5 breathing . This breathing is done by inhaling to the count of ten, then exhaling to the count of five. As you breathe in through your nose only, usually with eyes closed, count mentally to 10, then release the air through the nose only, while mentally counting to 5 at the same pace as the count of 10 during the inhalation. You must train yourself to focus on the ten parts of the body shown below while doing the inhalation. Then simply release the air with a mental count of 5. Breathe in one breath to the mental count of 10 while focusing on these 10 different parts of the body as shown in the picture below: (1) the skull and the air around it; (2) the right brain; (3) the left brain; (4) the right arm; (5) the left arm; (6) the torso; (7) the right leg; (8) the left leg; (9) the reproductive organ; and (10) from the crown of this organ to the feet. This is for one inhalation only. Then, simply release the air through your nose on the count of five, as if the air was coming out through the chest. One must try to picture the air going through those parts of the body as a form of energy or light. As you inhale, mentally vocalize the sound “yaaaaaa”. As you exhale, mentally vocalize the sound “hhhhhh”, unifying the two sounds to form one continuous mental calling. Once you have become proficient in the breathing techniques - you can then move on to the Ophanim postures. Shoshana told me that she had found what she called “The Movement of the Holy Letters of the Aleph-Bet”, an old and sacred art that had either been forgotten or put aside for centuries. It took her years of research to recover the complete body of that science, and now she was confident that what she had in hand was a rare insight into one of the oldest mystical practices in the world. Shoshana said she was very honored to share this with me, a student of her beloved teacher. 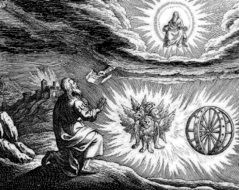 Shoshana also described an ancient mystery called by the Hebrew mystics the “Breaking of the Vessels”. The Hebrew letters, she said, were held to be the original receptors of Divine energy from the first created world, called the “World of Vessels”. At the onset of creation, these vessels broke apart, so to say, as they were unable to withstand the Divine Creative Light which entered them. This great light caused the vessels to shatter and fall down to create what became the physical realm. The spiritual element left from these vessels in this world is the letters, or language. Our work, according to the Kabala, is to bring the light of these vessels back up to their original place so that they can, with our help, withstand and then contain, the Creative Light again. In simple human terms, Shoshana said, through the letters of the Hebrew alphabet, we can help our bodies to withstand and contain the light of our souls. The letters thus become a connection between the light of the soul and the vessel of the body. Each one of these Hebrew letters represents a certain way for the Divine Energy to enter the body . She further explained the mysteries of these letters, and said that, according to her findings, there were particular movements of the body relating to the letters. She had eventually discovered, after extensive research, what she called a “dance” based on these letters. This dance was to naturally contain the mysteries described in the Sefer Yetzira about the Hebrew letters. The implication was that, for the first time, the wonder of Judaism was going to be witnessed in the world of bodies. Until now, according to the traditional view, the body was mainly elevated through not doing. Or doing for the sake of religious prescription only. It seemed as if Judaism was mostly preoccupied with providing the soul a pure enough residence inside the body. Purification of the physical realm through restraint was the main channel to communicate with our souls. But now a new teaching was giving birth to a sanctuary of direct expression of the soul through the body. The body can now speak the words of God. The exile in the head was over. On the next day, my teacher explained that by “dance”, Shoshana actually referred to non-moving still positions in the shapes of the Hebrew letters. Each letter, according to her, had a specific position relating to certain Sefirot, times, and parts of the body. By practicing the position of a given letter, at its particular time, one would draw spiritual energy from the Sefirot to one’s soul and to the part of the body associated with that letter. After a long silence, I remembered my teacher’s frequent insistence over the fact that he held the main focus of spiritual life to be the prayer. I said that I heard him many times teach that everything we learn from the Kabala is only for the purpose of freeing speech in the form of prayer, – that we, in this life, are ultimately only learning to pray. I did not understand how body movements fit into such a teaching. Rav Gedaliah answered that “the Dance of the Aleph-Bet” can also be called prayer — the Prayer of the Body.